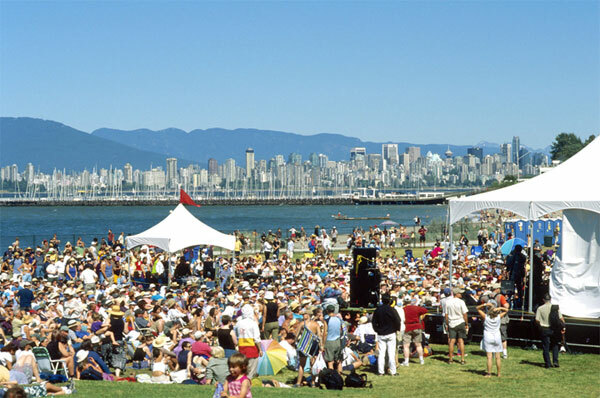 At the gates of the 32nd annual Vancouver Folks Music Festival at Jericho Beach Park, my husband Lance and I stood equipped with several necessities — our weekend passes, a pair of ear-mufflers and a backpack full of diapers. In previous years, we had only experienced the event from outside the fence, straining for a glimpse of the performers onstage. Now, we were prepared to enjoy an unhampered view, along with the thousands of Festival attendees and, even more notably, with our six month old daughter, Sienna. We were curious to see not only if the Festival would live up to our own high expectations, but if this event would be suitable for a Christian family with young children. Arriving shortly before the second act, we were surprised — in a way that flagged us as novice Festival attendees, I suppose — by the number of blankets already spread out like a colourful patchwork quilt, staking claim to any visible grass within the near vicinity of the main stage. Settling into a spot towards the back of the field, we noted with relief that we were not the only ones who had ventured to bring kids and their plethora of gear to the Festival. As I looked around, I saw babies and strollers, pre-schoolers playing in their red wagon, elementary-aged girls hula-hooping, and a little boy toddling amidst the crowd, wearing nothing but a cowboy hat. Far from being bothered, the crowd seemed remarkably receptive to these little people, even once the music had started. The most anticipated act of Friday evening was the full-bearded folk star, Iron and Wine; it did not surprise us when an exodus of people occurred after his performance. However, we were glad that we chose to stay, as the next band, Arrested Development, provided what was perhaps the most ‘fun’ entertainment of the entire weekend. Narrowly sneaking under the wide umbrella of the folk music genre, the band performed high energy hip-hop numbers, with positive, socially conscious lyrics. Squeezing into the front section, we joined the crowd of dancers and head-nodders. By this time, our previously sleeping daughter had made it known to us that she would not be left out of the party, so wearing a pair of ear-mufflers over her little ears, she joined us. Sienna was not the only under-aged dancer still at the Festival — just beside us were three generations of the same family, grooving to the same music. It was a welcome sight. Sunday morning, the Vancouver Outreach Community (VOC) Soul Gospel Choir commandeered a small stage, set against a beautiful backdrop of trees and blue sky. Missing my own church, I was looking forward to what was likely to be the closest thing to a church service at the Festival. Opening with a lively version of ‘This Little Light of Mine,’ the show progressed through a mix of songs, ranging from ‘I Believe I Can Fly,’ to the 60s hit, ‘How Sweet It Is (To Be Loved by You).’ With his characteristic energy, music director Checo Tohomaso bopped around the stage, garnering enthusiasm from both choir and crowd. The choir itself showcased several outstanding soloists, and while I thought the male section was rather weak, the enthusiastic clapping and dancing of the audience indicated they thoroughly enjoy the show. While labelling the performance as ‘church’ may have been a bit of a stretch, my spirit was lifted. It set a positive tone for the rest of the day. Later in the day, feeling the effects of too much sun exposure, I went in search of shade — a rare commodity in the main stage area. In my wanderings, I stumbled across the ‘Little Folks’ station, swarming with kids. Small pools of water and toys were being enjoyed by the younger children, and a large rock climbing wall had been set up for the more adventurous kids. Sienna was too young to benefit from the amenities, but I envisioned her joining the cheerful ranks of seasoned Festival kids in a few years. At one point, remembering a childhood visit to Martin Luther King Jr’s church with her father, ‘Pops’ Staples, Mavis emphasized the influence the preacher’s message of equality and social justice had on their songs. “If he can preach it,” ‘Pops’ had said, “We can sing it.” Coming from the family once hailed as ‘God’s Greatest Hit Makers,’ Mavis showed she is still an influential force in gospel music. Lest I portray the Folk Festival as a family-friendly utopia, I must caution that, while I did not recall seeing a single unhappy kid the entire weekend (save my own, close to feeding time), several musicians used strong profanities, and there were a number of references to drug use. That being said, however, the majority of workshops and concerts that I attended simply provided great entertainment by a talented group of musicians from places ranging from Ghana to Ireland to Canada, whose music often highlighted environmental issues, or areas of social injustice. As a Christian parent, I want to raise my child with not only an appreciation for the good things in God’s creation (music, community), but also an awareness of the issues that exist in this world, and an ability to infuse a Christian perspective into the dialogue surrounding those issues. The Folk Festival provides a terrific venue to facilitate these goals, while offering quality music and a fun atmosphere that can be appreciated by grown-ups and kids alike.